The 5th stage of Le Tour de Vino was unique in that we did it in two parts. Last weekend, temperatures reached triple digits and while we're all about making sacrifices to enjoy great wine, dying in the heat didn't sound very fun. To keep in the spirit of LTdV, we ultimately decided to do this stage in two pieces. Last weekend we left early in the morning and rode to Springhill Cellars well before their tasting room opened. Today, we revisited and actually tasted wine. 2007 WV Estate Pinot Gris: This pinot gris delivers at about .7% residual sugar, yet one may think its higher due to its strong floral aromas. Aside from being slightly sweeter than most pinot gris, I'd say it sticks to the genre fairly well without much deviation. This is very much more of a utility pinot gris that would be enjoyed by a wide audience. At only $15/bottle, you can't go wrong having a bottle of this sitting around. 2005 WV McLain Vineyard Pinot Noir: While not technically estate grown, McLain Vineyard is owned by the founder of Springhill Cellars, Mike McClain. The 12-acre vineyard in the Eola-Amity AVA yields both 115 and Pommard Clone Pinot Noir, and produces a nice drinkable Pinot. Relatively fruity, this Pinot will be a nice utility on the rack. 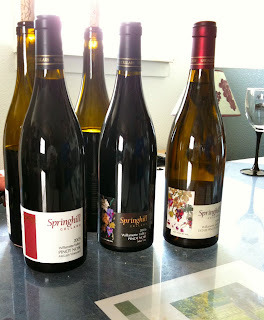 All in all, you should definitely check out Springhill Cellars if you're wine tasting around Benton County. It's always a treat visiting small-production wineries such as this and getting to pick the brain of the winemaker himself. If you go by bike and ride up Highway 20, be prepared to tackle some hills up to the winery. While it may be frustrating getting to the winery, riding back down is a blast. Anybody else have the opportunity to visit Springhill Cellars and try a wine we didn't? I hear they have a delictable Rose depending on the time of year. What can I say...Mike McLain is a great friend of mine and his wines spectacular. Glad you featured his winery! Strong line-up of wines, especially for the price! Nice views from the "backyard" too -- enjoy a bottle with a picnic there! A Celebration of Cycling and Wine! Barrister - it should be illegal!